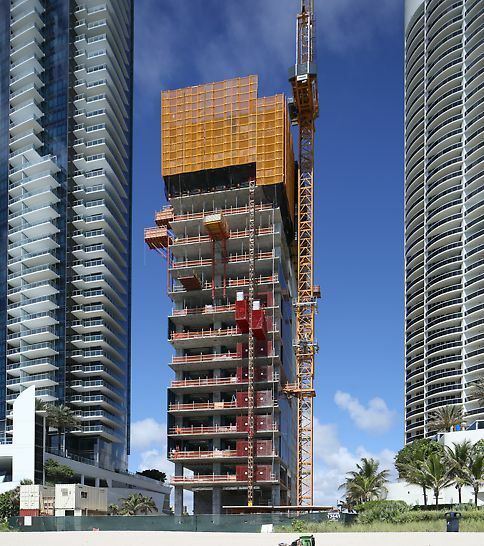 Located between the Atlantic Ocean and the intracoastal waterways, a short 30-minute drive north of Miami, the 47-story Muse offers just 68 exclusive residences. All feature 11-ft ceilings, floor-to-ceiling windows and 60-ft-wide terraces, some as deep as 38 ft.
To meet the challenge of constructing this high-rise on a compact site with a beach front setting to the east, a main thoroughfare to the west, and existing luxury condominiums to the north and south, the contractor chose PERI’s LPS Screen system. The LPS System contains construction debris and protects against falling materials and concrete splatter. 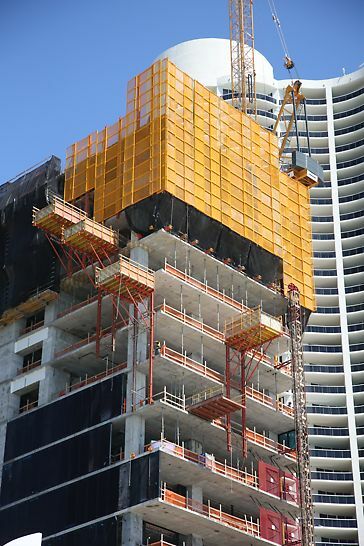 Three floors of LPS protection can be moved independently by hydraulics or crane at any time in the construction cycle. 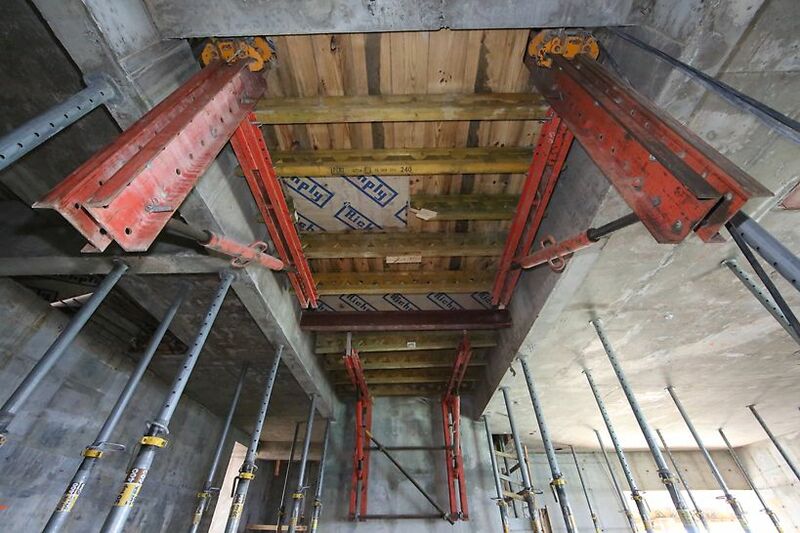 By hydraulically raising the loading platforms and the LPS Screens using PERI’s RCS Rail Climbing System, R and S South has achieved a three-day concrete cycle for setting the shoring and wall forming while also ensuring no materials fall from the building. Knowing that the neighborhood is protected throughout ongoing operations is providing peace of mind to all involved in the project. The LPS perimeter protection screen allows rail-guided climbing while the lightweight mesh allows for natural lighting in the building and reduced windloads on the structure. 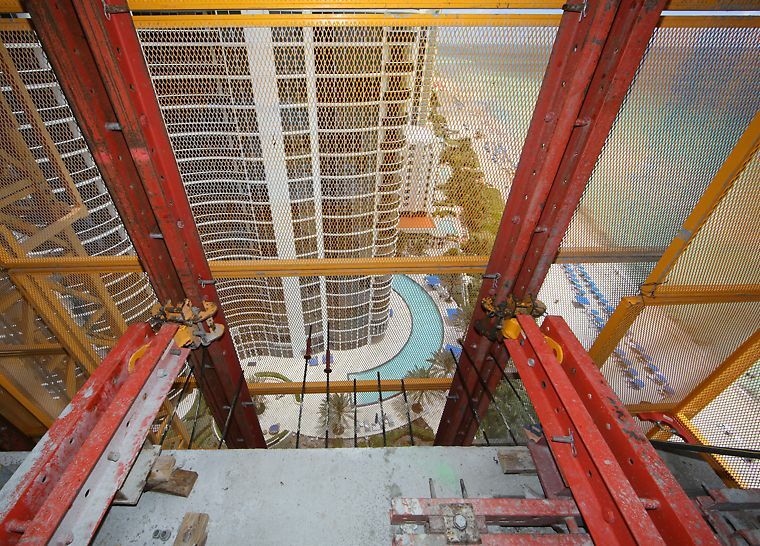 Hydraulic climbing or crane climbing and adjustable screen arrangement accommodates any building shape. PERI LPS has allowed us to turn a floor over every three to four days, containing debris and material inside the envelope of the tower footprint and eliminating the need for fall protection on the exterior at the level we are about to frame before men start working. LPS is the alternative to heavy, enclosed protection panel systems. LPS can be used as perimeter protection or with supplementary working platform for access to slab edge formwork.